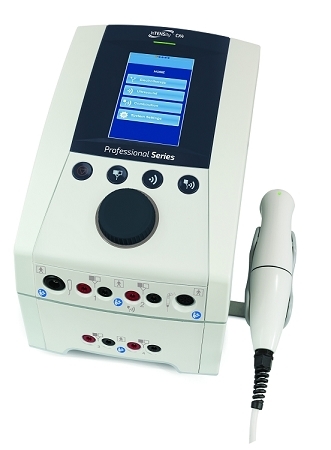 An advanced combination four-channel electrotherapy and ultrasound system offering the practitioner a wide range of treatment options in one user-friendly, ergonomic design. Features a color, touchscreen menu-driven interface intuitively groups and displays clinical protocols, guiding clinicians step-by-step to ensure the ideal therapeutic treatment. The four electrotherapy channels can be used in combination with ultrasound or totally independent with different protocols running simultaneously. The ergonomically designed 5 cm² sound head provides for an excellent ERA. In addition, the device offers a comprehensive library with treatment education and suggested electrode placement for better treatment outcome and improved clinic efficiency. 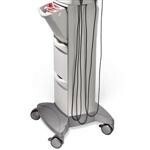 Integrates with either unit (CX4 or EX4) and keeps supplies organized and ready for treatments. This sleek design incorporates the cord within the cart and adds storage to eliminate cable hazards. Contains six separate concealed storage baskets on each side to keep supplies organized, four swivel casters, wheel locks and industrial strength engineering.